Newsletter publishing is no easy task, but MyPrintShopOnline can greatly simplify the process for you, and save you money at the same time. Although color and high-end graphics usually help to attract more readers to newsletters, there are also times when a simple black and white newsletter would be more appropriate. We can help you whether you want to go all-out with full color printing, or if you want a simple one or two color design. Don't overwhelm your readers with too much type without breaking it up a little with some color and graphics. If you are not using color, you can still break it up with graphics, diagrams or cartoons. Try to keep your articles short, unless you need to have a long explanation for technical reasons. Certain images and products will be presented better in color, such as food and clothing, or images of active people. If you are in a technical field, using more than 2 colors is not usually necessary. It doesn't matter if it is a country club newsletter, a company newsletter, car club newsletter, government newsletter, or a church newsletter, we can handle it. 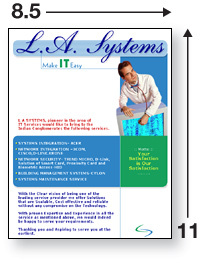 You have many formats to choose from, including 2 pages up to 8 pages (or more by special request). 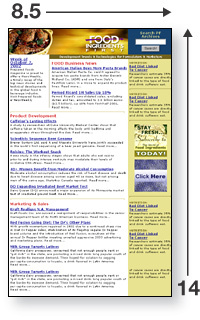 You can create your newsletter layout using virtually any graphics program, whether it is a Mac or PC version. We offer you a choice of economical 70# uncoated stock, 80# gloss text, 100# gloss text (Our most common), or for that high-end feel, we offer an 80#gloss cover stock paper. 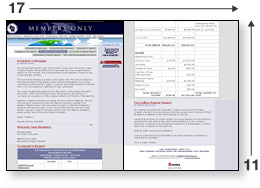 We have three different configurations to handle any amount of content you need to print for your newsletter. Click on one of the three different styles offered above to learn more about each one.